What happens in Vegas Stays FAR AWAY FROM ME in Vegas. Why? If you don't mind my asking? I was referring to a Tournament that was mentioned in a previous post. It seems that every single awesome tourney is held in a far, far away place. Im lucky that one is happening in Wallingford come the 21st, but its otherwise New York, Pennsylvania and Massachussets :blush. Too bad I dont live in Southern California or Japan!! I know, I was the one who brought up Evo in Vegas, I understand about the distance, considering you aren't that much further from Vegas than me. If you decide you want to go, Let me know, we could go together and split costs. Same goes for anyone else that wants to attend. Believe me Matt, I would love to go to Vegas.... but I do live in Connecticut and I would rather get my feet a bit more wet with Tekken 6 competition. I dont want to travel across the country for a few Tekken 6 matches.... I want to go to prove my yet to be fully developed Tekken 6 skills. Speaking of which, 10 wins in a row yesterday in Player Matches. Not too shabby eh?? I had to stop because I had to go to bed!! Currently 62.7% in Player Matches!! Nice one Gonna test it. Did you test it against techrolling CPU? Only then you're sure it's guaranteed. I often use d+2,2 after Bound. 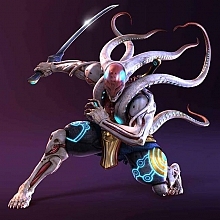 Sadly, everyone kept kicking me out as I tried to play as Tenshimitsu (I had quite a high rank as well, over Deity or something, 78% winning rate). So, keep going! Can you record one of your matches? Tenshimitsu : Nice one Gonna test it. Did you test it against techrolling CPU? Only then you're sure it's guaranteed. I recorded one hillarious match, but it doesn't show my combo skills. It was against an irritating king that kept kicking low 3 times.